Danger: Traveling this route during the tropical season from June until November is not advised. 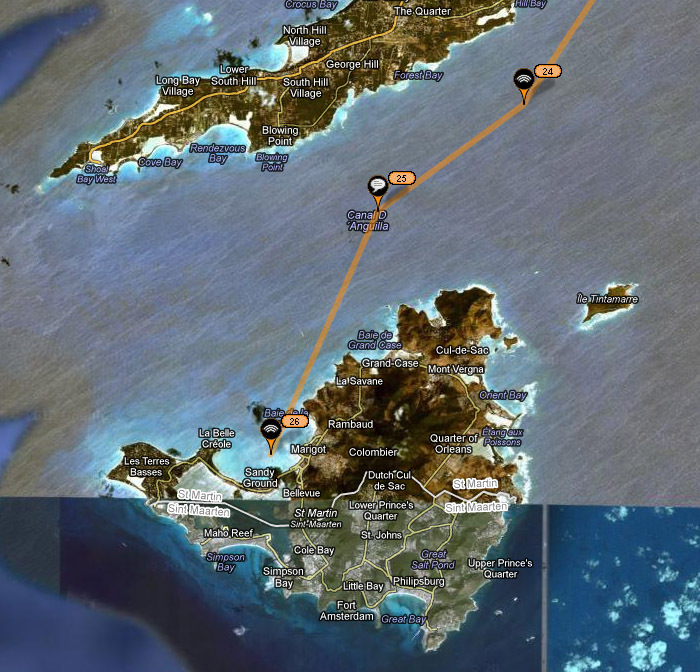 Traveling by sea from Florida to Saint Maarten is a 1,500 nautical mile journey upwind. There are two options: (1) the scenic route down the thorny path (2) the delivery route on route 65. The path to most take advantage of predominant wind conditions is route 65 as detailed in this article. This option is the proven path over decades to most quickly and safely jump from Florida to the Leeward Islands. The key concept is to avoid the strong southeast trade winds of the Caribbean. No matter your route you will be going upwind, but if you stay further north, then at least the winds and seas will be weaker. Route 65 refers to 65 longitude. The plan is to head east from Florida through the Northwest and Northeast Providence channels, stay around 25 degrees latitude, and then turn right at 65 longitude to power reach south to Saint Maarten. For this journey it is important to carefully choose your weather window. Catching a west wind would be awesome. More important is to avoid a Nor’easter when crossing the Gulfstream and any gnarly weather patterns awaiting in the Atlantic. I motored across Lake Atlantic and never saw any winds greater than 20 knots. I will take motoring into a 10 knot headwind over getting my teeth kicked in with a 40 knot squall any day. Depending on your waterline the trip will take anywhere from a week to two weeks. Other than picking a safe weather window, the trip has few navigation hazards. 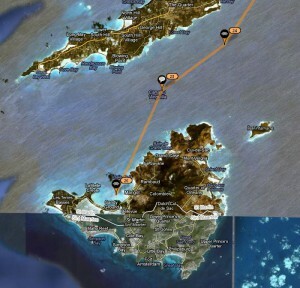 Once you pass Hole in the Wall, you will not see land again until Scrub Island off Anguilla. You will not run into much shipping traffic either. Just put on the autopilot, kick back, and enjoy the endless blue. On landfall in the French side, you can anchor in Margot Bay or Grand Case on the west coast, Oyster Pond on the east. Or find your way down to Simpson Bay on the Southwest Dutch side. If you pass through the Dutch bridge there are moorings in the Simpson Bay Lagoon and excellent service. Anchoring in the lagoon might not be the best option. It is a wonderful island, rich with culture, and incredible diversity. There is a siren type charm that lures you in and keeps you longer than you might have planned.